A few years ago, I picked up a semi-completed Electric XII project on eBay. I finished it and was very happy with the results. The original owner contacted me about a new Electric XII project he wanted to start. I offered to sell him his guitar back and he jumped on it, which left a hole in my collection! Back to the drawing board. This Electric XII replica started with an alder USA Custom Guitars Jazzymaster body with only the neck pocket and Gotoh XII bridge holes. Tommy at USACG did not have the tooling for the hockey stick headstock, so he suggested Best Guitar Parts for the neck. I made a laser-cut body routing template based on photos of original Electric XII’s. I slightly modified the upper horn which turned out to be closer to a Jaguar horn. After the routing, re-shaping and initial fitting, I sent the neck and body off to Matt at MJT Custom Aged Guitar Finishes for a light-relic Firemist Gold metallic body finish with matching headstock. Next, I had to focus on the metal parts, pickguard and electronics. I sent a drawing of the Electric XII “stinger” control plate to Marc at Rutters Guitars and he had a few cut and plated. The Gotoh XII bridge is a good one, but doesn’t look the part. I used a modified Fender Toronado bridge plate and the Gotoh saddles with the bottoms slightly file down. I used NOS string tree and switch paddle from Angela Instruments. Curtis Novak wound the pickups (fat wound bridge; stock neck). I used 1 Meg pots (Linear Taper Volume; Audio Taper Tone) and a Russian .033 PIO cap. 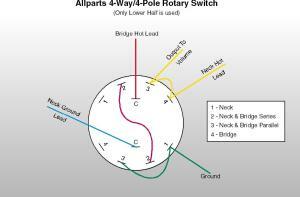 The pickup selector is a 4-pole/4way rotary available from Allparts (EP-4371-000). 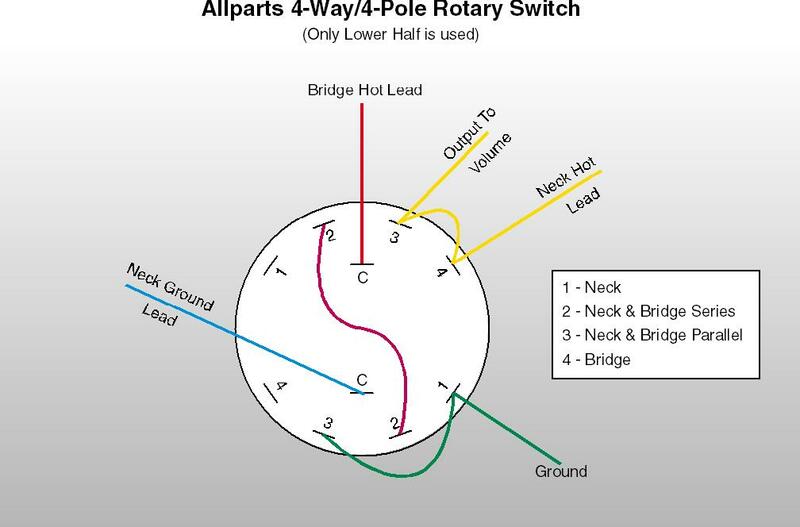 The original switch was a 2-pole/4-way, so you only need to use the lower half (see wiring diagram below). I had a pickguard template from the first project, but (as it always seems to happen), I had to make a few modifications to get the fit right. Guards like this are tricky, especially where they meet control plates and the bridge. I’m even happier with this Electric XII than the first project I finished. Now…maybe a Fender Maverick/Custom replica?